Second Foundation: "Search by the Foundation"
"Search by the Foundation" is my favorite story in the original Foundation series. Part of it is nostalgic, as I have vivid memories of reading the story as a young boy, but another part of is that it's in this story that you see most of the mundane, everyday world of the series, and it's a fun world to visit. You read about life in the suburbs and traveling by regular transport, and most importantly, you see a lot of the setting through the eyes of Arkady Darrell, a fourteen year old girl. My youthful self, falling headlong into science fiction fandom, was thrilled to find an easily relatable hero. Today, I'm impressed by how skilfully Asimov used this different perspective for expert world-building. And young and adult me agree, Arkady Darrell is the most purely fun protagonist to read about in the Foundation series, with the possible exception of Salvor Hardin. 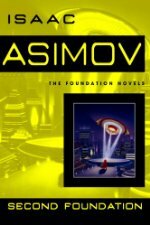 I was struck by just how far Asimov had gone from the early Foundation stories. The world of "Search by the Foundation" feels like a fully realized place. As a reader, I got the feeling that there was plenty that Asimov knew about the galaxy that he didn't have space to share. That's always a nice feeling in speculative fiction. I find it really fascinating that Asimov abandoned the setting after this story, not returning to it again for over three decades. My guess is that he felt like he had concluded the story. Personally, I quite like the ending, though I know many, many readers felt it was unsatisfying. As a child reader, I was completely taken by surprise by the reveal of the Second Foundation's location, and the identity of the First Speaker, and I still get a little thrill today. How do you like the ending? Even though I like the ending, I can't say I feel it's a happy one. The Second Empire, ruled by mentalics, seems like a dystopia to me. I can sort of understand the idea that a humanity whose emotions are controlled will be happier, at least in theory. However, I don't think I need to explain in great detail the distaste I feel for the idea. I can't imagine that many readers in the late 40s would have thought it a happy ending, either. Is there a case to be made for the Second Empire? The original series has such a fascinating trajectory. It starts with a briefly sketched idea of a Galactic Empire, a single town on a single planet beset by enemies, with a manifest destiny to take control of the entire Milky Way. By the end there's a fully realized setting, with a massive conflict between technologists and telepaths, and the manifest destiny has been subverted into something quite unsettling. All that said, there are some real problems. Frankly, the way Asimov writes female characters is, for the most part, dreadful. And the setting does sometime feel like a 1940s USA in space. But the reader's journey is still thrilling. It begins with a rather weird idea, psychohistory, and follows it along to an even weirder conclusion. Just following along as Asimov juggles his ideas, trying to avoid having them fall down, is a pleasure. What do you think of the whole original series, from Foundation, through Foundation and Empire, ending with Second Foundation? And does it hold up as the best series of the first few decades of science fiction? I love, love, love, Asimov's exposition through Arkady's overwrought, almost fan-fictionish essay. In every story so far, he pretty much explored every way to retell the backstory for new readers, and this was by far the most interesting. As far as being a 1940s USA in space, this is the only story where that feeling works. The Foundation at this point in history has a lot in common with the USA during the time it was written, what with having prevailed after a major war, being concerned about subversive internal political entities, and the increasing technological independence and idealization of youth. In regards to the ending, where the Foundation is the prosperous master of a Galaxy at peace and ruled by a shadowy coterie who keeps it at peace—I believe that readers in the Forties (let's face it, mostly young men) who had been through the war would have welcomed peace and prosperity at the price of the racist, misogynist authoritarianism of the Fifties. Many would have not had a problem with a Second Empire guaranteed by a Second Foundation. Would they have been right to do so? No, but it's very tough for me to judge those who have been through the hell of war. That's the implicit viewpoint and audience of these stories. That's why I'm glad the next book in this club is a Margaret Atwood novel from a feminist viewpoint about WWII and its effect on the victors' civilians.